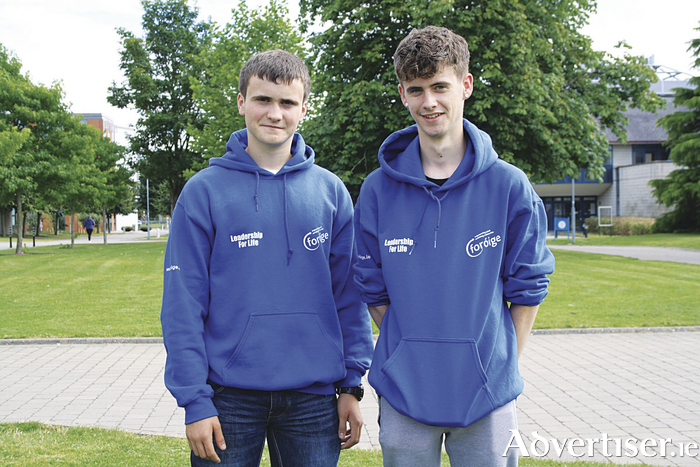 Two teens from Westmeath, Euan McDonnell from Mullingar and Adam Costelloe from Moate, attended the Foróige International Youth Leadership Conference in Maynooth last week. The conference brought together 250 teenagers from India, the USA and Ireland to learn how to become leaders in their own lives. During the week-long conference the teens learned crucial life skills such as empathy, decision making, communication skills, critical thinking, and team-work. Seán Campbell, CEO of Foróige, said: “The Leadership for Life programme enhances the vision, passion, and idealism of young people by teaching them key leadership skills and challenging them to use these skills practically. “Great leadership is grounded in respect and the ability to inspire. In the week ahead these young leaders will uncover the greatness within themselves and their own unique leadership style. The 250 delegates, aged 15 to 18, graduated on Friday morning, August 4, having completed various stages of the leadership programme. The Foróige Leadership for Life Programme was developed in Ireland in 2009 and is open to young adults aged 15 to 18. Delegates attending have been nominated by youth workers and volunteer leaders from their own countries because they have demonstrated an innate sense of justice, determination, passion, and ability to lead and make positive changes in their own communities. The programme includes lectures by a host of inspirational speakers, workshops on team building, critical thinking and communication skills, and peer discussions on matters of global importance. Young people are challenged to understand their own values and prejudices. Participants are encouraged to go beyond their own personal comfort zones and perceived capabilities to be better than they thought they could be.